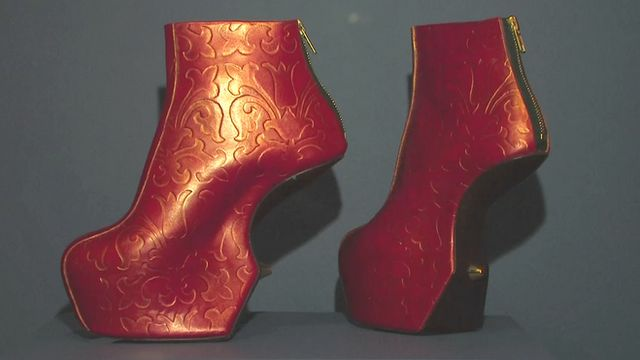 Shoes: The height of fashion Jump to media player Shoes: Pleasure and Pain is a new exhibition at the Victoria and Albert Museum. V&A exhibit celebrates Italian fashion Jump to media player An exhibition celebrating Italian fashion over the past 70 years has opened at London's Victoria and Albert Museum. How fashion survived WW2 rationing Jump to media player Fashion on the Ration, a new exhibition at the Imperial War Museum in London, tells the story of how people managed to keep themselves looking smart despite the shortages. A look at the McQueen V&A exhibition Jump to media player Will Gompertz previews the Savage Beauty exhibition at London's Victoria and Albert Museum., a retrospective of the work of late fashion designer Alexander McQueen. Stiletto heels may seem like a very modern phenomenon, but people have been wearing awkward footwear in the name of fashion for centuries. And putting looks before comfort happens across the globe. Shoes: Pleasure and Pain is a new exhibition at the Victoria and Albert Museum looking at the most curious ways we dress our feet. Helen Persson is the curator.